Spanish physician, anti-Semitic writer, and propagandist. 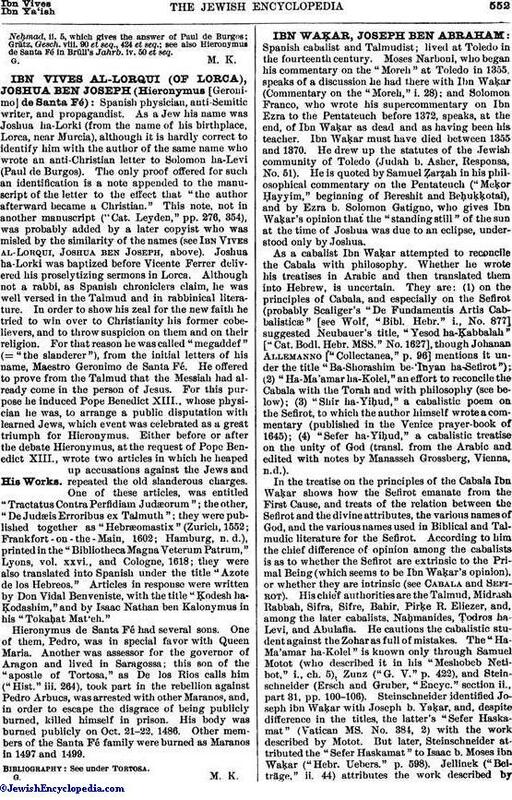 As a Jew his name was Joshua ha-Lorki (from the name of his birthplace, Lorca, near Murcia), although it is hardly correct to identify him with the author of the same name who wrote an anti-Christian letter to Solomon ha-Levi (Paul de Burgos). The only proof offered for such an identification is a note appended to the manuscript of the letter to the effect that "the author afterward became a Christian." This note, not in another manuscript ("Cat. Leyden," pp. 276, 354), was probably added by a later copyist who was misled by the similarity of the names (see Ibn Vives al-Lorqui, Joshua ben Joseph, above). Joshua ha-Lorki was baptized before Vicente Ferrer delivered his proselytizing sermons in Lorca. Although not a rabbi, as Spanish chroniclers claim, he was well versed in the Talmud and in rabbinical literature. In order to show his zeal for the new faith he tried to win over to Christianity his former cobelievers, and to throw suspicion on them and on their religion. For that reason he was called "megaddef" (= "the slanderer"), from the initial letters of his name, Maestro Geronimo de Santa Fé. He offered to prove from the Talmud that the Messiah had already come in the person of Jesus. For this purpose he induced Pope Benedict XIII., whose physician he was, to arrange a public disputation with learned Jews, which event was celebrated as a great triumph for Hieronymus. Either before or after the debate Hieronymus, at the request of Pope Benedict XIII., wrote two articles in which he heaped up accusations against the Jews and repeated the old slanderous charges. One of these articles, was entitled "Tractatus Contra Perfidiam Judæorum"; the other, "De Judæis Erroribus ex Talmuth"; they were published together as "Hebræomastix" (Zurich, 1552; Frankfort-on-the-Main, 1602; Hamburg, n. d.), printed in the "Bibliotheca Magna Veterum Patrum," Lyons, vol. xxvi., and Cologne, 1618; they were also translated into Spanish under the title "Azote de los Hebreos." Articles in response were written by Don Vidal Benveniste, with the title "Ḳodesh ha-Ḳodashim," and by Isaac Nathan ben Kalonymus in his "Tokaḥat Mat'eh." Hieronymus de Santa Fé had several sons. One of them, Pedro, was in special favor with Queen Maria. Another was assessor for the governor of Aragon and lived in Saragossa; this son of the "apostle of Tortosa," as De los Rios calls him ("Hist." iii. 264), took part in the rebellion against Pedro Arbucs, was arrested with other Maranos, and, in order to escape the disgrace of being publicly burned, killed himself in prison. His body was burned publicly on Oct. 21-22, 1486. Other members of the Santa Fé family were burned as Maranos in 1497 and 1499.